I feel like I’ve tried a bunch of new recipes recently, and the results have been very encouraging. I added two meals to the freezer and a batch of scones, and we’ve tried out some quick dinners. I also made homemade biscuit mix from a Taste of Home recipe, which I’ve already used for the scones, a veggie pie, and a meatball pie. Plus, Shawn and I made fried okra for the first time this week. Man, was that good. Like eating candy! Anyway, I wanted to have some easy go-to dinners and desserts in mind for when the semester starts. Now I feel like I am ready, at least food-wise, for the fall. 1. 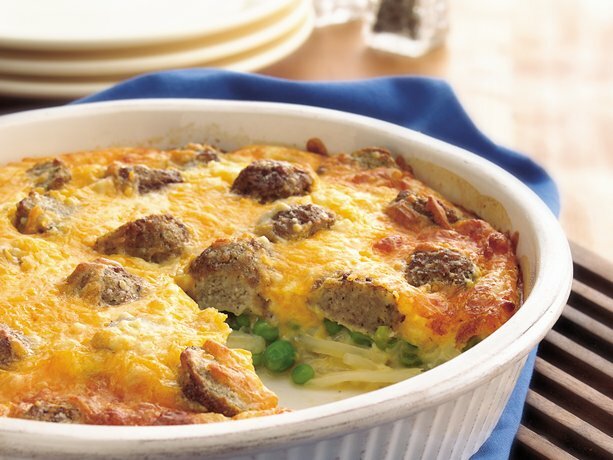 Meatball Pie. I bought BOGO bags of frozen meatballs at Publix last weekend. This was our first dinner using them. The only thing I changed was the crust. We had leftover rice, so I used that instead of the frozen potatoes. The big people really liked this one, and the littles (especially Sidney) loved the pea layer! 2. Smothered Meatballs. I wanted to use up some potatoes we got in our basket, and so I found this simple skillet dinner. I made mine with meatballs, real potatoes that I cut and boiled ahead of time, milk, and cream of mushroom soup. Heat it all up, and you are good to go! I also added a can of green beans to get some more veggies in. I doubled this, so we had it for dinner, Shawn took leftovers to work, and we have a frozen batch. Riley loved the meatballs, but Adrian wasn’t a big fan. 4. 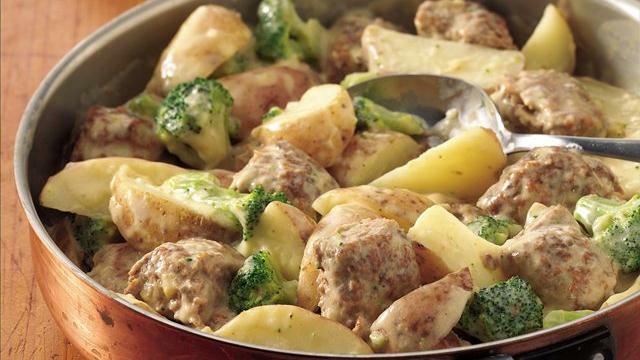 Sausage and German Potato Salad Casserole. My dad told me about this recipe. So easy, and it’s on the can of German Potato Salad: one can potato salad, one big turkey sausage thinly sliced, half cup barbecue sauce, and two teaspoons sugar. Mix together, bake for 35 minutes at 350. We all liked this one, or at least part of it. 1. My friend made dessert for me the other night, homemade chocolate pudding using coconut milk, dark chocolate, a dollop of nut butter, and NO sugar. It was amazing! (Thanks, Paulina!) So I, of course, had to get a can of coconut milk and give it a shot. I used one can of milk and a bunch of grated chocolate I had on hand, simmered it in a small pot, and made four small servings in ramekins. Then I ate all of them. Oh, and I used a dollop of Nutella in my pudding. So good! 2. I’ve also been obsessed with trying mug desserts. Tonight, I made a healthy-version of a chocolate chip cookie recipe I found on Pinterest. I substituted a kids serving of banana-honey Greek yogurt for the butter and egg yolk. Came out a little cakey, but it was delicious! Sometimes, I just cannot get through a day without a baked good, and these mug desserts are so easy to throw together with ingredients I have on hand. 3. I wanted to make another batch of Banana Bread Cobbler this week (Yes, it is that good!). I even hid two bananas in the bread basket so the kids wouldn’t see them and they could get nice and brownish. Yesterday, I check the bread basket, and the bananas are gone. Shawn gave them to the kids. Oh well. Maybe next week. I need to be a bit sneakier, it seems. So what exactly is in our freezer? A little bit of everything, which makes me feel good about going back to school and work and crazy weeks made crazier by Adrian’s Monday night gymnastics, Riley’s Tuesday art class, and Riley’s Thursday gymnastics. Plus, I will be on campus four days this coming semester. I need a full freezer. I feel like I am nesting but with food and in preparation for the school year. Let’s call it “Festing.” Food-nesting. Four boxes of frozen waffles. The littles eat these frozen, and Adrian can put down three in a single morning. Two and a half packs of bagel thins. Put some nutella on these bad boys, and I will be out the door! And of course, my freezer would not be complete if it didn’t have a couple bags of frozen breast milk. Nothing like the stash I had when Adrian went off to daycare. Then, I don’t think we could fit too much else in our entire freezer. It was crazy! Now, I might have a half dozen bags. In a large bowl, combine the remaining ingredients. Add noodles and dressing; toss to coat. Serve immediately. Yield: 10-12 servings. 60 dollars a week apparently means I am starving my husband! He said he has lost fifteen pounds this past year, and we think that his weight loss is due to his higher intake of vegetables, increased yard workload, and our tight grocery budget. It’s hard to get a lot of meat for 60 dollars a week. And when we do, it is usually something that is 2 dollars or less per pound (like chicken). Fortunately, Paul treated him to a steak for lunch one day while we were in PA, and I treated him to a Brazilian steakhouse for an early Father’s Day treat. He should have his fill of meat, especially red meat, for a while. Since we returned home last night to an empty refrigerator and two of the kids woke up early, I decided to hit Kroger’s right away. My plan was to hit Kroger’s and Publix, but I ended up spending almost 60 dollars at Kroger’s, so I called it a week, and we headed home. 10 boxes of cereal (yes, TEN), 2 boxes of Cheez-its, 1 container of Keebler cookies, 2 huge tubs of cookie dough, 2 boxes of instant coffee, a box of fruity tea (I have been craving tea recently! ), bread, eggs, a container of Greek yogurt, 2 packs of American cheese, a bag of pretzels, 2 cups for the kids, a pack of steel wool cleaning pads, 2 rolls of kitchen garbage bags, bananas, 2 cans of baked beans, and milk. Kroger’s had a save 5 dollars on 5 items deal that I used 3 times. I also had 7.25 dollars in coupons (most for the cereal). I barely filled our frig, but we were getting desperate for cereal, and I couldn’t pass up some of the snack and dessert deals. Next week, the goal will be to get more dinner foods, especially to complement our bountiful basket, which we are going to start ordering again. Saturday: Barbecue chicken (from the freezer) and some fresh veggies from our basket!